This weekend, HBO won one of those queasy victories available only to true-crime documentarians and war-crime prosecutors at The Hague. 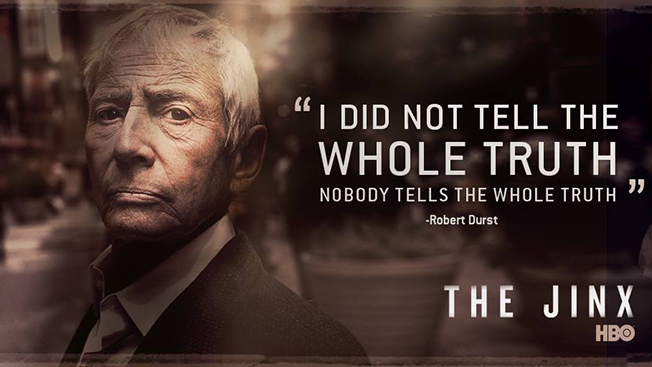 The subject of the network's multi-part documentary series The Jinx: The Life and Deaths of Robert Durst, a wealthy guy who (at least as far as the show is concerned) pretty obviously murdered some people, was arrested shortly before the finale showed him confessing to multiple murders into a live microphone. "What the hell did I do?" he mutters. "Killed them all, of course." It's great TV. It's also awful TV. It's the kind of TV that Says Something about the Human Condition, in the way that Sarah Koenig's watercooler-ready podcast Serial, which is perhaps less lurid but no less concerned with the minutiae of a really heinous crime, also Says Something. And it's the beginning of what will undoubtedly be a true crime documentary bonanza, horning in on territory often associated with the relatively sleazy pleasures that have made Discovery's wildly successful Investigation Discovery (ID) network such a high point in the conglomerate's recent ratings history. HBO was pretty happy about the outcome, obviously: "We simply cannot say enough about the brilliant job that Andrew Jarecki and Marc Smerling did in producing The Jinx," the network said in an unbylined statement. "Years in the making, their thorough research and dogged reporting reignited interest in Robert Durst's story with the public and law enforcement." To be sure, this is programming everybody enjoys, but the key to Serial and The Jinx is that it's programming everybody can enjoy publicly. It's not a guilty pleasure; in fact, being a fan is almost mandatory in any intellectual social circle. That doesn't mean the shows can't be scary—watch the trailer for Jinx below for proof of that—but there are some things viewers are looking for in this kind of programming that will allow them to admit watching it. Part of the issue is simply spending more money; magazine shows and reenactment-heavy true crime guilty pleasures can be stacked high and sold cheap pretty easily; Koenig and Jarecki both put a lot more time, effort, and, consequently, dollars into their projects. A lot of true-crime TV is set in the grimiest possible parts of California, Florida or Michigan—people hurt each other, often in horrible ways, all time time, and the perpetrators are sometimes pretty pitiable. The premise of The Jinx is that Durst is untouchable and therefore worthy of scrutiny; the premise of Serial is that the court case against Adnan Syed, now in prison for murder, is filled with holes that require more than a cursory review to reveal. While you can argue that Jinx comes to a much more satisfying conclusion than Serial, the latter explores the ugly byways of the criminal justice system in incredible detail, exposing the way defendants often find themselves on a nonstop train to prison once they've been arrested, putting the onus on the cops in a way that's fair to neither them nor to the accused. Whether or not you believe Syed murdered his ex-girlfriend, the process seems unfair. And remember: if someone did something horrible, they're going to seem human if you're responsible about portraying them accurately. "I pray for a sociopath," Innocence Project's Deidre Enright told Serial's Sarah Koenig, "because I never get those guys. I get the innocent ones and I get these dumb 'so me and my friends smoked crack for three days and drank five bottles of whatever and then we got a plan.' That's who I get. All. The. Time. So, I think the odds of you getting the charming sociopath, you're just not that lucky." Jinx director Andrew Garecki? Well, he actually was that lucky. When you make top-notch true crime programming, you are doing journalism, and it's the kind of journalism that will face scrutiny on a level few are prepared for. When Koenig's podcast finished, her work was subject to innumerable think-pieces—there was the racism thinkpiece, the thinkpiece about the racism thinkpiece, the re-reporting, the outright trolling, and ultimately, while detractors found a stray fact here and got an interesting interview there, it was impossible to cast aspersions on Koenig herself. She'd called everyone. Witnesses who came forward after Serial concluded admitted that she'd contacted them (or else were slapped down hard when they lied about it). No matter the subject, Koenig's mantra from early episodes of the show—"all facts are friendly"—had better be yours, too. Already, people are speculating whether Durst's confession will be admissible in court. The investigation into Syed's case, unsatisfying as it ultimately was, shone a light into some dark corners. Race relations, the way the law treats nonwhite offenders generally and Arab offenders specifically, the myriad ways attorneys can mess with, damage, and destroy people held by the law—these were all part of Koenig's soundscape, and they were all worth thinking about. Jarecki, too, found a fascinating way to talk about inequality with The Jinx—Durst's untouchability is much-remarked and his arrest an apparent validation of the idea that justice ought to apply to the very rich and the very poor alike. Too often, viewers leave crime stories benumbed, and while that doesn't mean they watch them in smaller numbers—Investigation Discovery is pretty cheerful about the way its programming plays up to prurient interest ("My libido was probably stronger than my smartness!" GOLD! )—it does mean they don't get talked about in the same way. Both Serial and The Jinx kept audiences strung along by tacitly promising a major payoff (Koenig even tried to walk it back in the final episode—"Do I have an ending?" she asked herself. Lady, each of us shouted at our smartphones, I am freaking out right now), and even though Serial absolutely did not in any way offer audiences a smoking gun, we as a nation like being jerked around. It's OK to admit it. And if you're a programmer, it's OK to do it—drama is part of the equation. These are, after all, things we like about fiction, too, so if you can unearth (or imply) that real life can be just as intense as a David Fincher movie, we'll want to talk about it. Especially if we can pretend we're talking about it because we care about big, important, intellectual stuff.